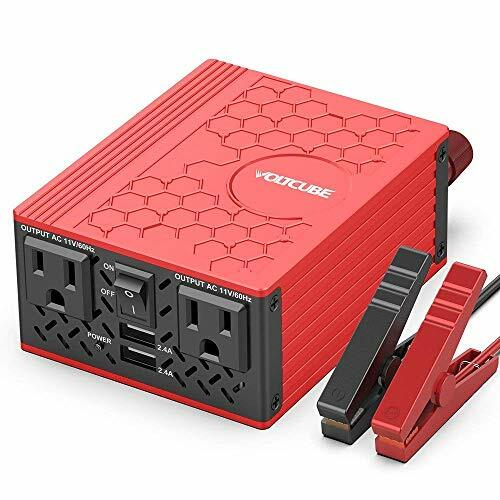 VOLTCUBE 400W Power Inverter, 12V DC to 110V AC Car Adapter with Twin 2.4A USB Ports and Two Independent AC Outlets (Red) by VOLTCUBE at Buy Car Now. MPN: AP3022-400W. Hurry! Limited time offer. Offer valid only while supplies last. Why Choose Us: Voltcube is a professional manufacturer of automotive and electronic products, particularly specializing in portable power inverters. Voltcube is a professional manufacturer of automotive and electronic products, particularly specializing in portable power inverters. The digital premium chipset of this power inverter is more efficient and offers more protection. All components used are of a high quality. Please connect the red cable to the positive (+) terminal and the black cable to the negative (-) terminal, then tighten the terminal nuts carefully. If the power consumption of the electric appliance is less than 150W, the inverter may be used with a car cigarette lighter socket. If more than 150W, the inverter must be connected directly to the car battery terminals using the alligator clips. Always ensure that the total rated power of the connected appliances is less than 400W. Avoid placing the inverter in a location that receives prolonged direct sunlight or is near to heat sensitive materials as the inverter can become warm during use. 【TWO INDEPENDENT AC OUTLETS】This power inverter provides 400 watts of continuous DC to AC current to 2 independent AC outlets for multi-purpose use (the plug sockets are now further apart to accommodate larger plugs). Great for when you need power on the go, this inverter will charge your laptop and other devices, power your appliances and run other things such air mattresses, CPAP machines and other medical devices. 【SAFE AND EFFICIENT】This inverter features 2 built-in replaceable 30 amps fuses that protect your device. As well as this, the integrated silent cooling fan helps dissipate heat and prevents which keeps the inverter running efficiently. Smart chips offer 95% energy-efficiency with only 3 watts of power being used to run the inverter itself. 【DURABLE AND STYLISH DESIGN】The aluminum honeycomb design of this inverter makes it very durable and provides great heat dissipation too, as well as looking great too. 【A WORTHWHILE PURCHASE】The Voltcube 400w car inverter is supplied with high-quality alligator clips and cigarette lighter connecter so that it can be directly plugged into your vehicle or connected to the battery. What's more, it comes with 2 free replacement fuses. If you have any questions about this product by VOLTCUBE, contact us by completing and submitting the form below. If you are looking for a specif part number, please include it with your message.